Water is the most precious of mankind’s natural resources. Only 2.5% of all Earth’s water is fresh, and often this water needs to be purified to become potable. Over 2 billion people worldwide have gained access to safe drinking water since 1990. Nevertheless, 780 million people remain without a safe supply of water according to a report from UNICEF and the World Health Organization (see Figure 1). In order to improve this condition, several water purification methods have been used/developed including: boiling, distillation, reverse osmosis, chemical methods (precipitation and cementation), membrane filtration, ion exchange, solvent extraction, and adsorption techniques (using activated carbon, synthetic materials, Iron, Aluminum, Manganese oxides or biosorbents). Nevertheless, only a few of these methods employ inexpensive materials or systems and can provide cost-effective local solutions. This article focuses on the combination of sand filtration and adsorption using Manganese Oxides – one of the few cost-effective solutions. 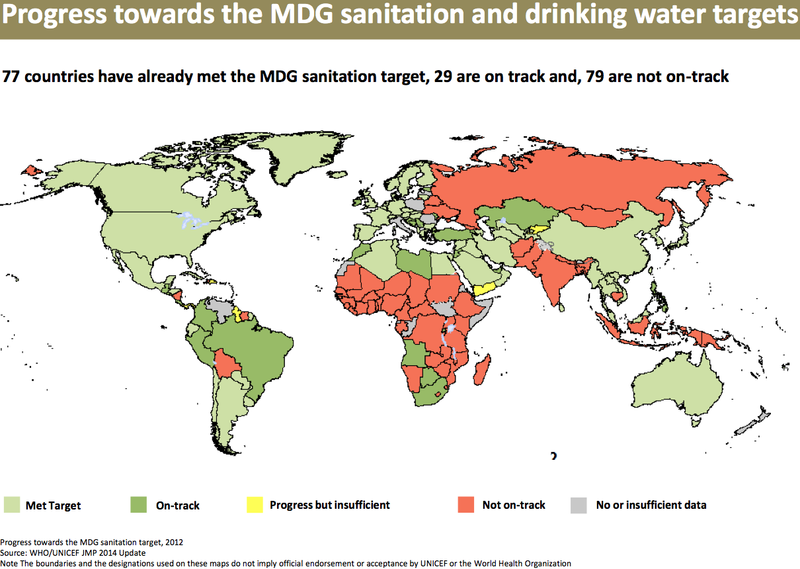 Figure 1: Progress towards the Millennium Development Goals (MDG) in sanitation and drinking water targets (image source: WHO/Unicef Joint Monitoring Programme for Water Supply and Sanitation). Manganese Oxides (MnOx(s)) are nanominerals which are very important in our world due to their several uses in different applications: catalysis, pesticides and fungicides, sensors, energy storage (supercapacitors) and alkaline and rechargeable batteries. Their characteristic property of removing undesirable and dangerous particles and species from water (like lead and arsenic) is especially useful in water filtration systems. Manganese Oxides usually form a beneficial coating (with time) on the surface of filtration media (such as sand), which aids in the process of scavenging contaminants (see Figure 2). Trace amounts of metal ions (such as: Al, Cu, Ni, Zn, Pb, As, Cd, etc.) and other species that are suspended or dissolved in water are permanently incorporated into the coating. The important effect of manganese oxides is therefore to achieve the removal of trace contaminants (often metal ions) that would not be possible with simple filtration alone. Figure 2. 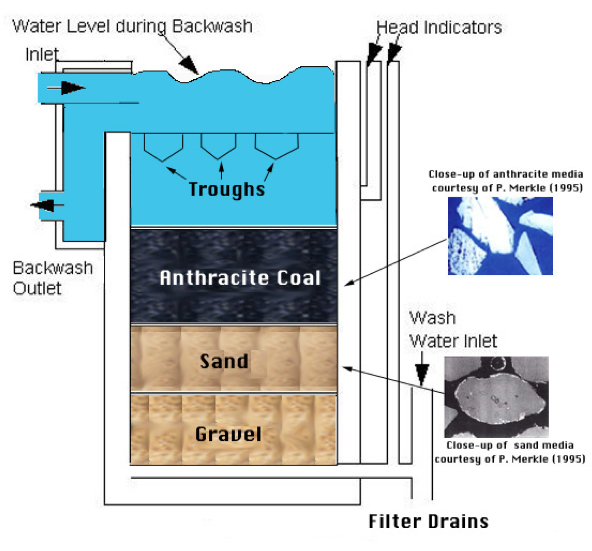 Schematic diagram of filter bed in a water treatment plant illustrating tiered filtration media: anthracite coal and sand, and gravel as support material. (image source: Virginia Tech). Researchers have studied manganese oxides for several decades at the macro and micro-scale in water filtration, but they have not been able to successfully give explanations of the fundamental principles that govern this process of metal ion removal or the formation of these surface layers. To date, researchers have only been able to determine the effect of MnOx(s) coating layers on the water quality outcome through elemental analysis, which is a method to determine quantitatively or qualitatively the type of chemical elements present in the sample. 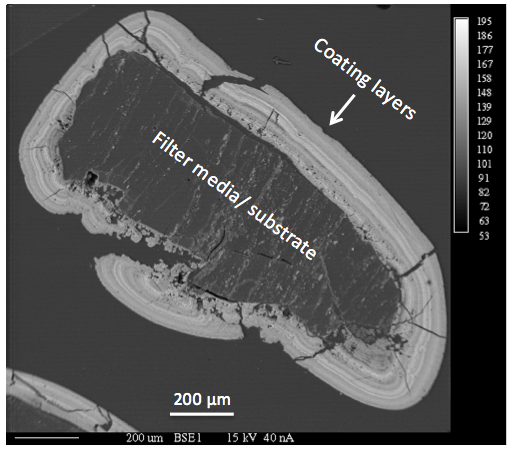 They have also examined properties and characteristics of these oxide coatings using different techniques — such as microscopy — capable of distinguishing features just micrometers in size, as in Figure 3. Unfortunately, the features relevant to this uptake and removal process are nanometers in size and therefore an understanding of this mechanism has remained elusive. Figure 3. Scanning Electron Micrograph showing an Anthracite coal filter media coated with layers of Manganese Oxides (in cross-section) from a water treatment plant in Newport News, VA. The dark/bright layers are the result from Mn/Al enrichment, respectively. (Tobiason et all, 2008. Characterization and performance of filter media for manganese control). Recently, advanced analytical transmission electron microscopy techniques have been used to demonstrate that the surface features of the filtration media do play a major role in the formation of the surface coating layers, and in identifying the nanostructure of these coatings. Such recent studies at the nano-scale appear promising in elucidating the mechanisms that govern the removal of metal ions from water and the formation of the surface coating layers. If successful, these studies may permit the development of an inexpensive and environmentally conscious metal ion adsorbent that will enable greatly improved filtration devices and systems – something that is sure to change the lives of millions who still wait for safe drinking water. Michel Vargas is a 2010 fellow of the Fulbright Science & Technology Award program, from Ecuador, and a PhD Candidate in Materials Science and Engineering at Virginia Tech.